Glass is often carried using a suction cup lifter. When replacing a car window, the first step that needs to be taken is to verify and document the year, make, and model of the vehicle with the broken window. Each specific car or truck will have a certain type and style of window that will be used. Of course, some windows are interchangeable so if a used window is being installed, check online or in a book and find which ones will work. Never start a project without having the proper window and a set of tools, so that it can be accomplished all at one time. The second tip that will save time is to remove the interior panel and loosen the brackets and clips that hold the window in place. Each manufacturer uses a different system, and each year is different, so obtain a repair manual for the specific vehicle. Do not try to take any shortcuts when it comes to this because even though it may be possible to remove the window without following the directions in order, replacing a car window will be much easier in the end if they are. Each manufacturer will follow these steps when the car or truck is built, so replacing it should be done in the same order. After the mounting brackets and clips have been removed, the next stage of replacing a car window is removing the old piece of glass. If it was broken be sure to clean up all the pieces of debris, and make sure that there is nothing in the track that may cause problems. Since the window is out it is a good time to check the wires and motors and replace them or repair them if needed. The final step in the process of replacing a car window is sliding the new piece of glass into place and securing it down with the brackets and clips. Before doing this, though, be sure that the glass is clean and free from burrs and bumps. If any are present, either grind them off or have a glass specialist do it. This will reduce the chance of the window binding up once it has been installed. Follow the order that was taken to remove the glass, except in reverse, and make sure to secure the brackets and clips properly. Do not over tighten the bolts and screws, and make sure that the clips are placed in the proper places. When reinstalling the inner door panel work carefully around the body clips so they are not broken, and attach them by starting in one area and working around the entire edge, which completes the task of replacing a car window. 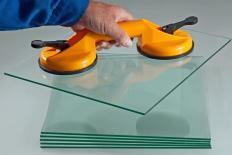 How do I Become an Auto Glass Installer? What Should I Consider When Buying Car Shades? What are Different Types of Window Film? What is the Best Way to Wash a Car?